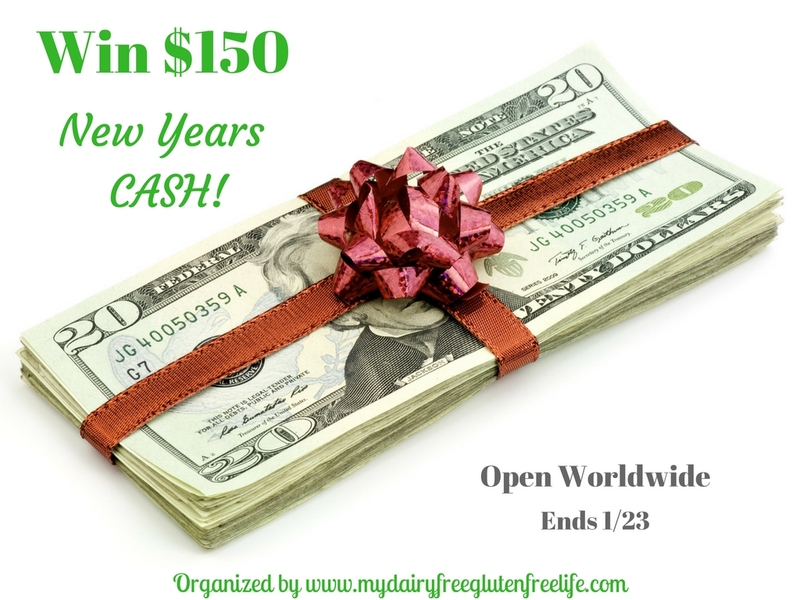 What better way to celebrate the New Year, but with winning a $150.00 in CASH!!?? Just leave me a comment below telling me what you would do with this $150.00 if you won? I live in sunny California, and it actually rained today! My sate is minnesota & it is snow & cold, but at the moment visting bf in WI and it already snowed overnight & very cold! I live in Massachusetts. It is cloudy and very cold. I live in Los Angeles, California and it is raining cats and dogs outside. I live in Oregon and the weather is over cast,rainy and very cold,we are kind of just hibernating like bears until it’s over. Here in Mobile, Alabama, we had torrential rains Saturday and bitter cold (for us) Sunday -17 degrees overnight! I live in Manitoba. It*s cold today, but there*s no wind, so it*s actually rather pleasant to be out in. St Louis, Missouri—After 4 or 5 days of below freezing temps, including some snow (not very much) it will get into the 40’s today, 50’s tomorrow, 60’s Wednesday—-then back to freezing, drizzle, ice. I would buy the book “Living Life to the Fullest with Ehlers-Danlos Syndrome”to have as a resource for me and my family, I would also buy a good pair of warm boots! I live in WA State. It is cold and wet, big surprise it’s WA State. You know, I have not bought myself new books in a long while. There just has not been money, so Ihave been recycling old books. Not nearly so much fun. I think I would go wild and buy books. It is winter and so many need help. That is what I would do with the money. I’m in freezing cold NJ and would love a chance at winning!! Thanks Nettie! I live in Upstate New York, and it’s dang cold here. What would I do with the money? Support my local animal shelter with most of it and then replace a couple of small kitchen items with the rest. I’m in Indiana, although we like to joke that we’re as much from Illinois as we are from Indiana, since we are a stone’s throw from the border. We’re just a few miles outside of Chicago, too, so we get the best of both worlds – the suburban life we love and still can go into the city whenever we want. We’re actually only a few miles away from rural areas, too, so it’s really nice. We are just getting over a really cold spell. The temperatures this week are supposed to be in the 30’s and 40’s for the high this week, which is normal for this time of year. They are predicting the possibility of snow later this week. Luckily, what we’ve already gotten this winter melted before the current cold snap. I live in Kentucky and the weather is cold and snowy. I am from Arkansas. Close your eyes and the temp. will change 20 degrees. We had snow on the ground yesterday and Thursday the high will be 70 here! In Ok it’s in the 40’s today. from Manila, Philippines, hot weather here, and hope everything will be better soon… thanks dear bloggers and founders of the website, and hope to win. God bless us all. I live in Wisconsin and today it snowed. I live in So. California and it was overcast today and 65º. I live in MN and it has been snowing all morning. The traffic is so terrible!! I’ in Ny its dry but in the high 20’s. I would use the money to put towards an Ipad. The weather is lovely here in Phoenix, AZ it is 65 and sunny. I live in Wisconsin and today is a gorgeous day. It is cold, but it is winter in Wisconsin so I really wouldn’t expect otherwise. Today the sun is shining and it is a welcome sight. I like in Michigan and we just had a glazing of ice today. We are in SoCal (Southern California) where it is rainy and chilly tonight! we moved to montana this summer. it has been exciting. we went from big city to small town and from warm weather year-round to all four seasons. it is very cold this winter and there always seems to be snow falling from the sky. it is beautiful, but very cold! I live in Florida and it was 80 today. Hi Nettie! My daughter got asked to prom this past weekend so I would and could use $150 to help buy her a dress. If I won, I would buy myself a really nice bra…I know it sounds silly but I am very large up top and I have never had a decent bra with good support that fits right and I’m 26 yrs old lol so yea! How fun! I love contests! I live in California. We’ve had a ton of rain. and we need it! I love this give-a-way. My fingers are crossed! It is a warmer-er day today. In the 50’s. Cloudy. Much better than the foggy and 12 degree days we had last week though! I live in Georgia and it is a beautiful day here – dry and sunny. I live in Ohio and our weather recently has been “weirdly warm”.